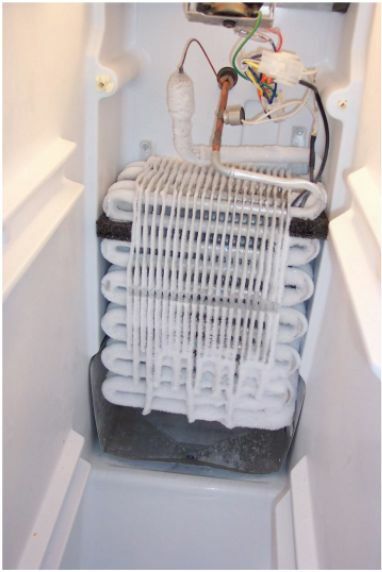 If you’re trying to figure out how to replace the ADC board in your Maytag or Jenn-Air refrigerator, then you’re working on fixing a defrosting problem and the evaporator coil in the freezer looked something like what’s shown here (click for larger view). So, you’ve done your due diligence and checked the continuity of the defrost heater and defrost thermostat. Now you’re ready to change the ADC board. What’s that? You don’t know how to check the defrost heater and thermostat? No worries, mate, this Instant Guide® on making simple electrical measurements and this picture will get you going on that. ☞ First, buy the new ADC board here. ☞ After the board arrives and you’re ready to begin work, unplug the refrigerator before you even think about opening to the door to start. ☞ The ADC board, item 13 in this picture, lives behind some flimsy plastic, at the ceiling of the beer compartment. Getting the big plastic tray out may take some fiddlin’ and twiddlin’. It’s supposed to come out by inserting your fingers in the grooves in back, gently pulling down and out (towards you) at the same time. In reality, it can be a frustrating tug fest. Keep dinkin’ with it, it’ll come out. The rest is plug and chug. If you need more help, come see us in the Samurai Appliance Repair Forum. This entry was posted in Refrigerator Repair on July 14, 2006 by Samurai Appliance Repair Man.